#Reigate back to school on a HIGH? Several models (GFS, GEM, ECM) are getting wobbly with the high pressure this weekend and bringing in a trough or upper low pressure down the North Sea over the weekend or up the English Channel early next week. Either way such scenarios will bring less settled weather to the SE this weekend and early next week: cloudy, some showers, but probably light mostly. This is not a collapse of HP (high pressure) because pressure remains generally high and the jetstream well to the north of the UK. Most models also suggest a building back of pressure next week, probably further to the north leaving the south vulnerable to unsettled conditions at times. Best of the weather by Week 2 of September is likely to be Scotland. Point to note is that UKMet models do not see such an unsettled weekend, so things not certain… but seems to hint at vulnerable nature of the anticylcone. HIGH building back stronger than ever second week sept.
Anticyclonic conditions are building over the UK in the coming week or so courtesy of ex-hurricane Cristobal which is tracking NE across Iceland this weekend. The ex-hurricane has morphed into a deep low pressure that is dragging warm tropical air behind it into the Mid-Atlantic thanks to the jetstream and this is helping to build high pressure across the Atlantic and over Scandinavia. 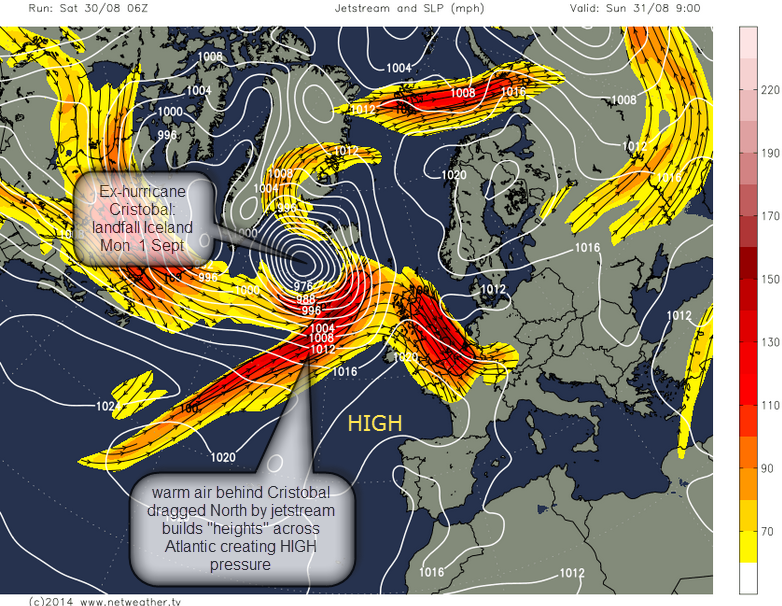 Whilst the black and white UKMet synoptic chart (below left) shows surface pressure, the colourful chart (below right) shows important UPPER air flow as well as surface pressure on a so-called “500hPa” chart. Upper air charts often represent conditions at at 500hPa (hectopascal) and are commonly used by meteorologists to get a better idea of how the atmospheric conditions will develop over longer periods of time. This is because upper air is less disturbed by surface features such as oceans and mountains and by the influence of day and night that can upset surface charts and make them awkward to interpret predictions over longer time periods. Upper air charts most commonly show temperature at 500hPa, or 5km altitude, which is about “half way” up through the troposphere, well away from surface upsets. Upper air temperatures usually correlate with surface pressure, but not always. See below to compare 2 charts, one surface and one upper air, for the same time period. 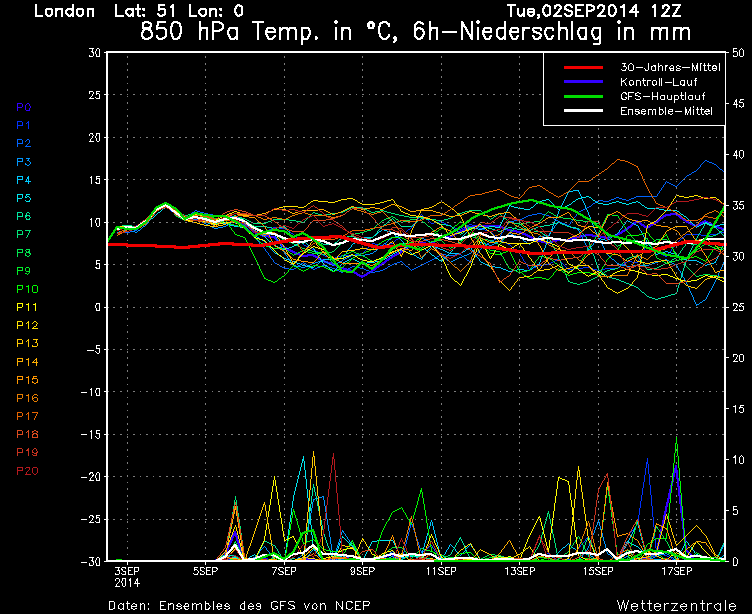 Warm upper air, usually of tropical origin, is shown on the 500hPa charts in orange and red colours. Cool polar air at height is shown in green and blue. Where the colours are tightly packed together it shows a steep temperature gradient and this is often associated with the jetstream. Warmer air is less dense and, rather like fluffing-up a thick duvet, takes up more “space” in the atmospheric column compared to the the thin “blanket” of cold Polar air. As warm air increases the 500mb “height”, fluffing up the atmospheric duvet, more pressure is exerted on the surface which increases the air pressure. Cloud formation is inhibited as air sinks, warms and dries out. The HIGH being built early next week, initially over the Atlantic, is formed by a warm upper flow of Tropical air pumped into the Azores high by an upper SW jet following on the heels of ex-hurricane Cristobal. So HIGH pressure will bring settled weather across much of the UK, including here in Reigate and the SE, for about a week with some warm temperatures and light winds and generally pleasant weather with some sunshine. However, not all models show a uniformly “clean” high i.e. 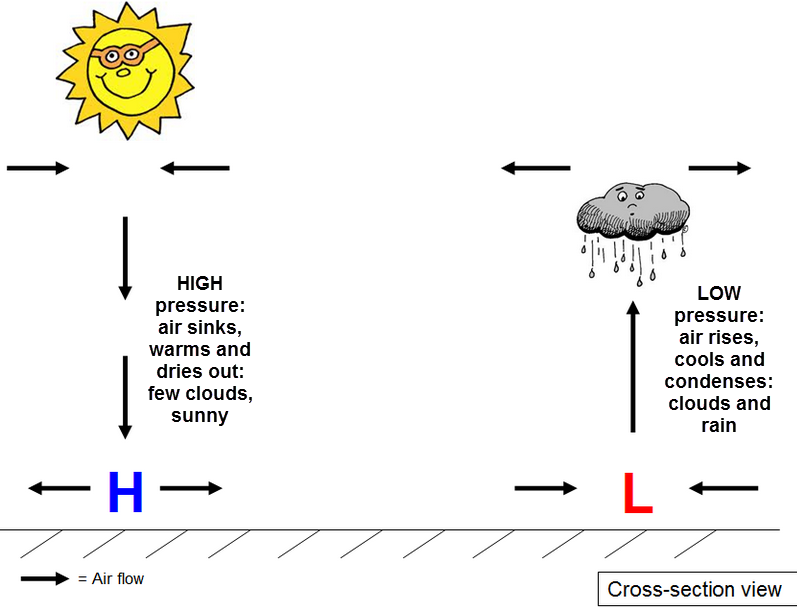 an anticyclone that is free from cloud and blocking all incursions of cool or moist air. Note the UKMET chart (up) shows some weak fronts wriggling across the HIGH and this could mean cloudy skies for some and even odd showers at times. Rainfall charts also do not show completely dry weather throughout next week (see below). The ECMWF model (above right) shows a weak trough / cut off low feature to the west of the UK mid-end of next week and eventually forming a low feature in Biscay. If this scenario comes off it could temporarily spoil the HIGH and possibly send showers into the South as it drags in warmer humid air from a southerly direction later next week. So the exact duration and nature of the high is still a little uncertain so check back and also check UKMO of course for updates. By later in the second week of September and beyond an active Atlantic with the possibility of more extra-tropical cyclones will probably start to breakdown any remaining high pressure. 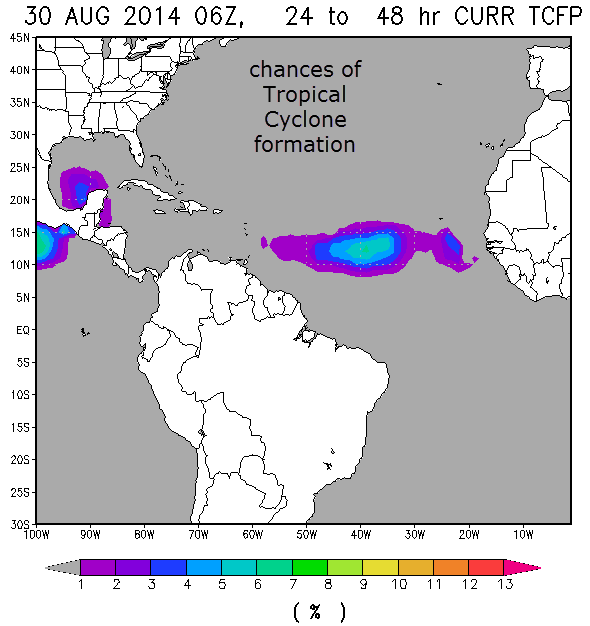 The chart above shows the chances of tropical cyclone formation (TCFP) in the Atlantic and, whilst % figures are low, this still represents a fair chance of cyclones forming and ultimately entering the mid-latitudes later in September. So this might not be a durable blocking high or one that lasts. Nevertheless, it is good enough to keep active Atlantic weather systems at bay for a week. The positioning of the HIGH is also critical to how “warm” we will get in the UK. This time of year the continent is still warm so high pressure over Scandinavia to the NE or East of the UK brings in some warm continental air on an easterly flow. This is how the GFS and UKMO sees things developing initially with a high positioned over Scandinavia and Europe through mid-week. This flow could yield temps by Thursday in the mid-20’s, up to 25c is possible for SE. With sea surfaces at their warmest this time of year it could be a good time to head to the beach. By next weekend most models (above) see some movement of the HIGH to the west and NW of the UK where it could introduce a cooler Atlantic flow from Iceland. So peak temps are probably reached before the end of this week. Further ahead several models suggest a breakdown mid-September to a more unsettled regime. The CFS temperature chart shows a rather sudden decline Mid-Sept and then again in October. Whilst this is not surprising for the time of year, such steps in the CFS can indicate frontal systems and depressions as different air masses arrive across the UK. Warmer than average Atlantic sea surface temperatures, in some places nearly 5c above normal, is likely to encourage the formation of active depressions as is usual for Autumn.